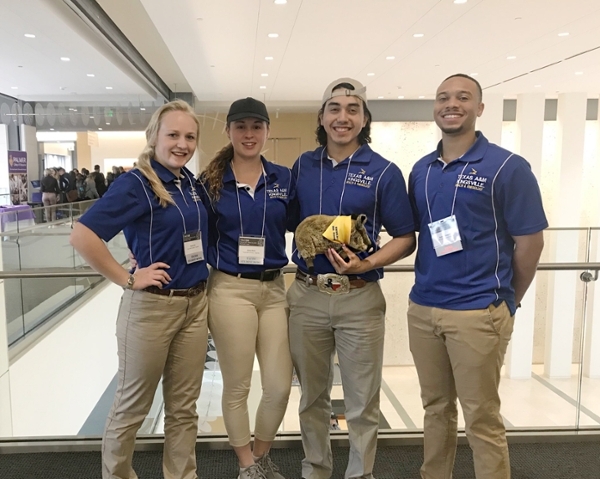 A team from Texas A&M University-Kingsville placed 3rdout of 35 teams at the Texas American College of Sports Medicine (ACSM) Student Bowl in Fort Worth. The Texas ACSM Student Bowl is an annual event where teams of undergraduates from universities from all over Texas compete in an academic quiz bowl devoted to exercise science and sports medicine topics. This is the best finish that the team from A&M-Kingsville has had in the 10-year history of the event, surpassing the 2016 team that placed 5that the event held in College Station. The team from A&M-Kingsville consisted of Armando Gonzalez, Alyssa Fick, Abbey Wells, and alternates Isaiah Culpepper and Isabel Soto. Texas ACSM is one of 12 regional chapters of the American College of Sports Medicine (ACSM), which is the largest exercise science and sports medicine professional society in the world, with over 70,000 members dedicated to advancing and integrating scientific research to provide educational and practical applications of the exercise sciences and sports medicine.